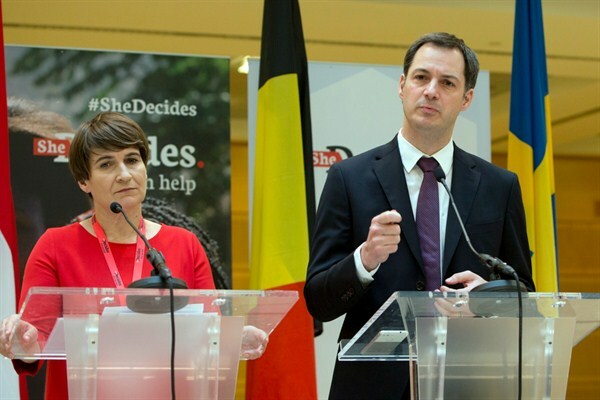 Belgium Deputy Prime Minister Alexander De Croo and Netherlands Minister for Trade and Development Cooperation Lilianne Ploumen discuss the She Decides initiative, Brussels, March 2, 2017 (AP photo by Virginia Mayo). Three days after his inauguration, U.S. President Donald Trump issued a memorandum reinstating the Mexico City Policy, which was first adopted during the Reagan administration to block recipients of U.S. aid from providing abortions or abortion counseling. While family planning experts have consistently noted the harmful effects of the policy, known as the “Global Gag Rule,” they also warned that the Trump administration’s version is much worse, as it applies to a wider range of U.S. global health assistance. Other donors have tried to step up and provide aid that would otherwise be lost as a result of the policy. In June, Sweden’s aid agency said it would stop providing support to reproductive and sexual health programs run by groups that comply with the rule. In an email interview, Scott L. Greer, professor of global health management and policy at the University of Michigan School of Public Health, and Sarah Rominski, research assistant professor in the Department of Obstetrics and Gynecology at the University of Michigan Medical School, discuss the effects of the policy and how the world has responded.